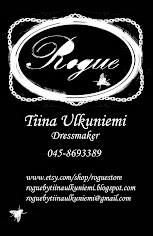 Rogue by Tiina Ulkuniemi: Crossed bons yet again. I think next I will make some sort of off shoulder dress. By the way I have one pair of the crossed bones shorts in size M in stock and ready to be shipped out.